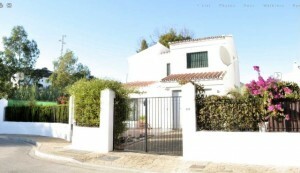 Casa Listo is a well presented and is situated on a spacious corner plot, near the scenic area of Lake Vinuela. Located on a complete development with all mains services, street lights, pavements and tarmac access. The property comprises Spacious entrance hall leading into large, light open plan lounge/diner with feature fireplace with enclosed log fire. The kitchen is separate and fully fitted and functional with a door leading onto the side terrace. There is the advantage of an integral garage fitted with storage cupboards, with access from the road, plus an off road parking space. Stairs to first floor landing into master bedroom with ceiling fan and fitted double wardrobe. Then there are two twin rooms which are identical. Bathroom with bath and shower over the top. The property is fully secure with walled gardens and gated entrance. Ample terracing around house with gates to both sides, there is a BBQ fitted and artificial grass round the pool area ( 6m x 3m) allowing this entire property be low maintenance and secure. Casa Listo is a very reasonably priced and is a lovely 3 bedroomed detached Villa in an exclusive residential area yet close to all amenities and the lovely Lake Vinuela.